Before you decide that you want to come to Mary Washington or not, you need to ask yourself one question. Am I going to college to get an education or to party. If the answer to that question is to party then go to another school. Mary Washington is not a party school. It is very much a learning environment and you may find yourself having to do more school work then you thought you would have. 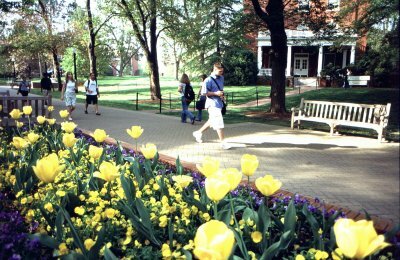 Weekends at Mary Washington consist of having fun with the friends you make, going to a school club sponsored event, or enjoying a nice walk around the scenic areas. If you are looking for some place to party around Fredericksburg, you won't find it. You can go to D.C. to party but that is probably the closest place. Think that Fredericksburg is halfway in between Richmond and Washington D.C. so think more suburban middle class families rather than city fun. If you answered the question with you are going to get an education then Mary Washington is one of the best schools. The classes are fun and interesting and the small class sizes allow professors to know your name and allow you to talk to them if you don't understand something. The teachers are really helpful and want to see you succeed. The campus is quite beautiful and well landscaped and the people here are really friendly. The reason that this school gets the low ratings that it does from people is that they expect the University to be a party school but its not. You will find that most people who say negative things about the school went home the first two weekends to see a boyfriend/girlfriend they held onto from high school and then don't realize how they have no one to hang out with on the one weekend they stay on campus. If you come to Mary Washington, you have to be willing to make friends and stay on campus for the first month at least and you should be fine.